Tiana Jones-Bey (center) and dancers. Dusk had just settled at Berkeley's Covenant Worship Center last Thursday, as a group of parishioners arranged themselves around the pulpit. The chairs were empty. The lights were out. Rows of scrolls hung from the walls, quoting Isaiah, Romans, and Corinthians. Two stereo speakers sat stage left of the pulpit. Someone popped a CD in the stereo, and a powerful, sampled drumbeat wafted through the room. God is good, so we don't need no music crooned gospel singer Jamaal "Mali Music" Pollard, his voice skating easily over the drums. The parishioners lined up in two rows, waved their arms, and tilted their bodies. They looked right, looked left, looked center, and began toe-heel shuffling across the stage. Their moves were quick and fast and clean, some poached from ballet, some resembling West African dance. Mali's lyrics hewed to liturgical themes, but the performance looked like hip-hop. In the center of the group stood 26-year-old Tiana Jones-Bey, wearing baggy warm-up pants and a scoop-neck T-shirt. Balancing her infant son in one arm, she used the other to gesticulate. "Good, stomp-stomp," she said, pointing to a dancer in the corner. "Now everyone else should be stomp-stomp-clapping the whole time. ... Mahini, flap your arms. You like, flopped them a little bit. You need to bring them up a little stronger." Commandeering a troupe of ten dancers is never easy, especially when they vary in ability. But Jones-Bey had a natural command, perhaps honed from her day job as a behavioral therapist. She grew up in Victorville, studied theater at the University of Southern California, and found the Lord during her sophomore year. She and a group of girlfriends began choreographing routines to gospel music before they knew praise dance was a discipline. 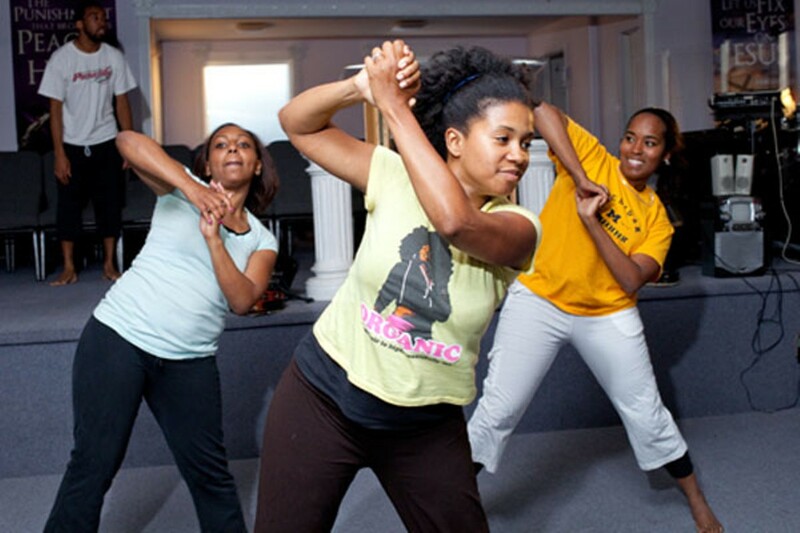 She founded a dance ministry at USC and bequeathed it to other students after she graduated in 2005. By the time she moved to Oakland and joined the congregation at Covenant, she was taken with the medium. Jones-Bey says praise dance is not a form of entertainment but a tool useful for spreading the Gospel and promoting spiritual uplift. But to the untrained eye, it's sure spectacular to watch. 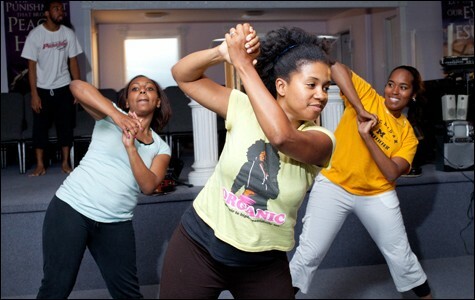 Normally, Jones-Bey rehearses her praise dance ministry every Tuesday night at Shawl-Anderson Dance Center. This week she'd added an extra practice to prepare for the annual Bay Area Praise Dance Festival, held Sunday June 27 at Julia Morgan Young People's Performing Arts Center. The festival features ten acts and more than forty dancers, all interpreting music with gospel and spiritual themes. The event is sponsored by Ross Dance Company, whose founder, 27-year-old Tecsia Evans, also belongs to Covenant Worship Center. Evans will lead her company in a piece called "Conquerer." The history of praise dance is a little unclear. So, too, is its relationship to religious sacrament. Nonetheless, it's catching on in Pentecostal churches throughout the United States, and even percolating into the secular world. The music is catchy, driven by propulsive drumbeats and the occasional synthesizer, and always paired with fierce gospel vocals. Praise dance routines have the look, feel, and sensuality of modern jazz or hip-hop, even if practitioners reject that comparison. "We believe ourselves to be dance ministers, not just dancers," said Jones-Bey. "It's about speaking to the people and delivering a specific message." Yet, it's no surprise that many praise dance ministers — including Evans — came from a modern-dance tradition. Growing up in Modesto, Evans was a high school cheerleader. She helped run summer camp programs, majored in psychology at UC Berkeley, and performed hip-hop routines at football and basketball games as a member of the Cal dance team. She didn't start reconciling her religious faith with her interest in dance until she joined Covenant in 2005. She formed Ross around then, but it's not an overtly religious company. Only in the past couple years did she begin incorporating praise dance into her repertoire. The main choreographers at Covenant —Jones-Bey and her friend Loran Clay — say praise dance is a protean art form that can exist across denominations. At this point, though, it's mostly associated with African-American churches. Ostensibly, such innovations are more about worship than spectacle. But it's the spectacle part that really draws people in. Jones-Bey seems to have found a happy medium between dance-as-discipline and dance-as-bliss. On Thursday, she led her dancers through a variety of physically taxing moves, molded them into shape, and kept everyone from checking the Lakers-Celtics scores on their iPhones. At one point, all ten dancers lined up in a row. One by one, they each executed a quick, perfect soutenu turn, creating a ripple that ended with Mahini Nia Showers falling into the arms of Noah James. Jones-Bey scrutinized her troupe. "Now this little thing is a hot mess," she said, walking over to the group. Look," she said, as the dancers broke into two rows, again. "This is about as spread apart as we should remain." Jones-Bey took her place, stage right, in the back row. She stretched out her arms. "Look on your peripheral," she told the dancers. "Are you in one line?" Toward the end of the night, Jones-Bey had her company perform the song in its entirety. But for a couple flubs (and two dancers knocking into each other), it was taut and exquisite. Dancers did high, perfect kicks and leaps, heel-toe-shuffled across the stage (a move that Jones-Bey called "the attitude chug"), and clapped asymmetrical rhythms. The song had a three-against-two feel, meaning the dancers would do three evenly spaced claps over two beats. James wiped the sweat off his brow. Showers looked winded. Jones-Bey beamed. We don't need no music, chided Mali, from the stereo speakers. The lyric sounded like a rallying cry.